A year ago I published a post on Sprint Retrospective Techniques that I employ to help my team to continuously improve. Since then I have tried out many other techniques to keep things fresh for the team. In this post I present three more simple techniques I have found to be especially effective. The Cool Wall is my favourite retrospective technique at the moment as it is not only very effective but also a lot of fun. I discovered it while browsing blog posts on the web looking for new retrospective techniques to try out. I am a fan of the UK motoring show Top Gear and this technique is based on an occasional segment from the show, “The Cool Wall“. 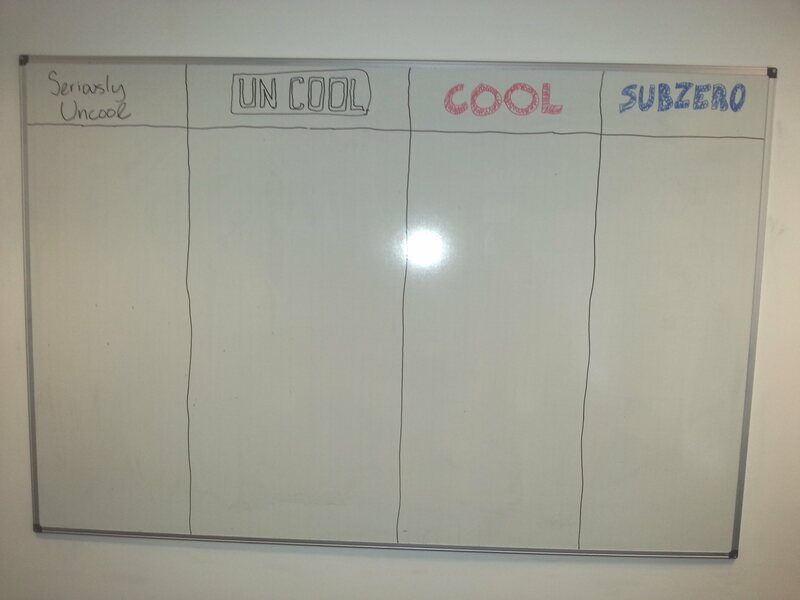 In the show the presenters Jeremy Clarkson and Richard Hammond decide how cool various cars are by placing pictures of them in various categories labelled: “Seriously Uncool”, “Uncool”, “Cool”, and “Sub Zero”. The show involves audience participation but ultimately the presenters (especially Clarkson) decide how cool each car is (usually overriding the audience). 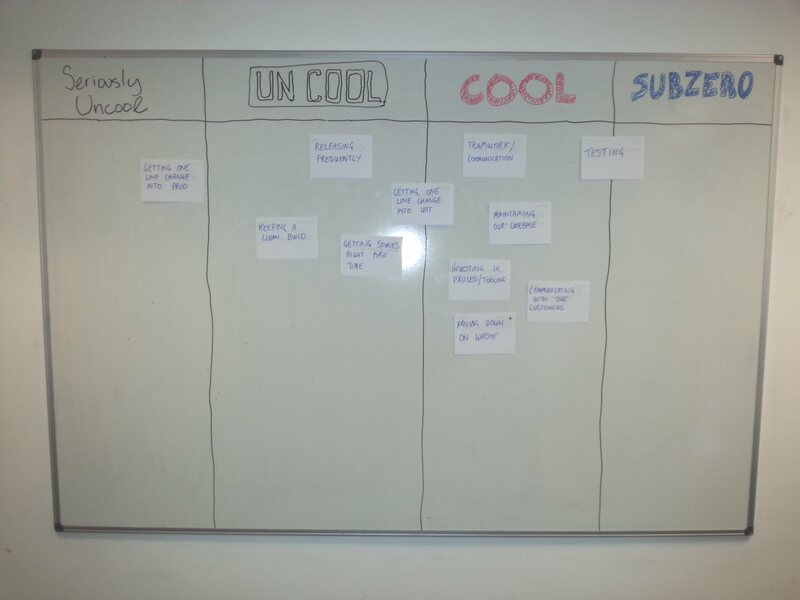 For the retrospective version of The Cool Wall the cars are replaced by cards that represent positive practices or behaviours that the team engage in. For example, ‘Continuous Improvement’, ‘TDD’, ‘Listening to Customer Feedback’, etc. The better the team decides they are at the thing written on the card the cooler the category they agree to place it in. 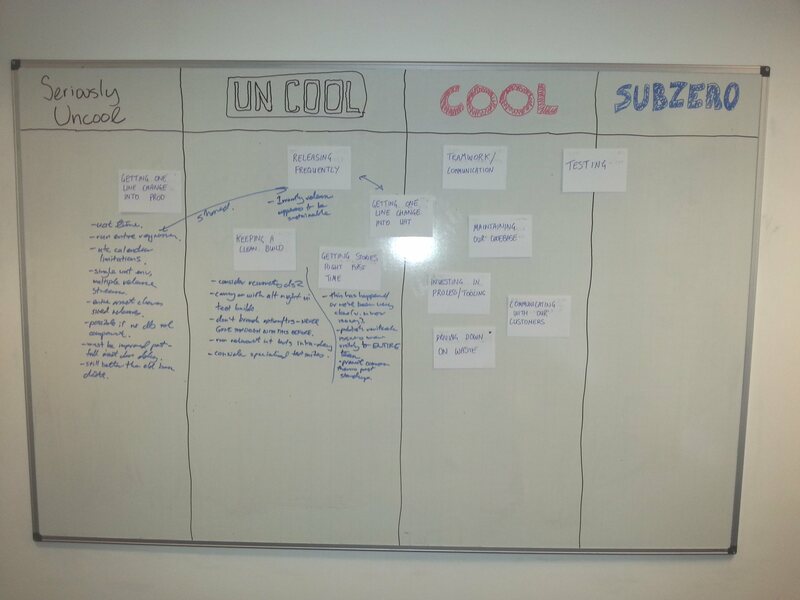 The Scrum Master then places the card on the board in the agreed “coolness category”. The most important difference between the retro technique and the TV show (and the reason it works as a retro technique as opposed to as entertainment) is that the audience/team decide on “coolness” not the presenter/Scrum Master. The technique requires a little preparation. Beforehand the Scrum Master should prepare the behaviour/practice cards. The content should be topical to the particular team and their current circumstances. I also create small voting cards for each “coolness” category to allow the team to efficiently vote rather through the yelling and shouting that happens in the TV show. This also prevents the team from aligning themselves with the first vote that is shouted out. 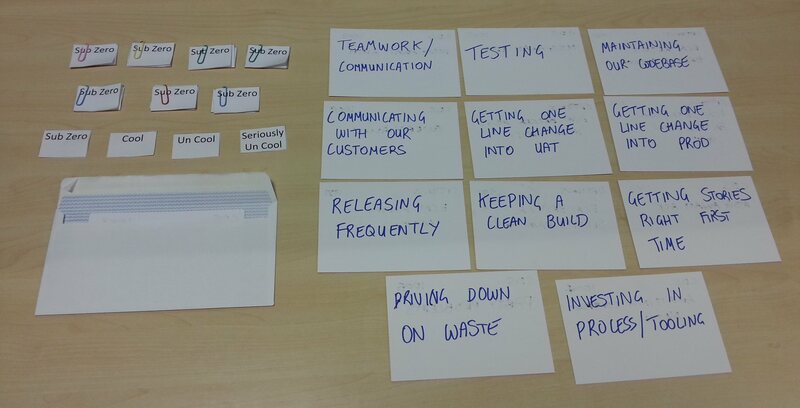 I have written about Lean Coffee before in reference to the Lean Agile Glasgow meetups. 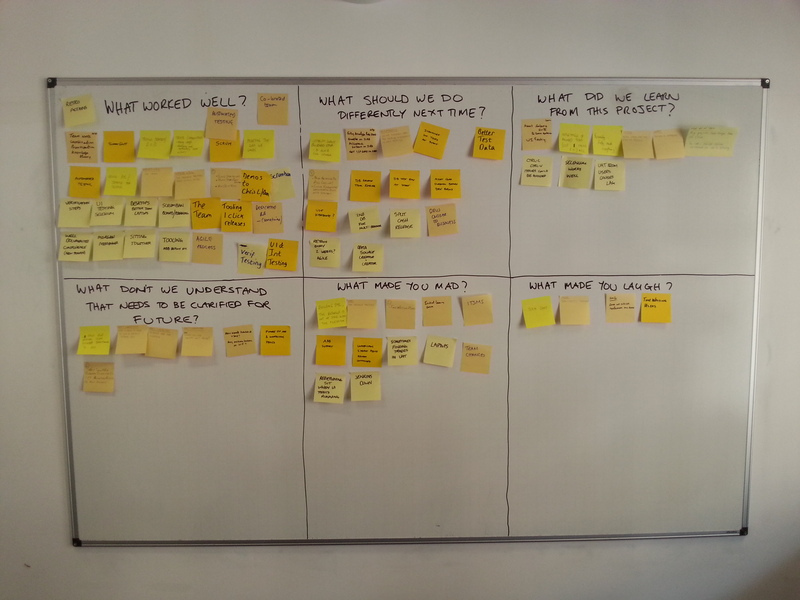 Lean Coffee is a great technique for democratising meetings which is also suitable for retrospectives. The democracy comes from the team providing the topics and prioritising them for discussion. While I allow an hour for most retrospective sessions I run I find that a Lean Coffee retrospective session requires up to two hours for a full discussion of the most important topics to take place. It is also the only type of retrospective that I run with the team sitting down as it does not require the use of a board. Everyone takes a few minutes to write up one or more stickies with topics they would like the team to discuss in the retrospective. Go through the stickies one by one with the author briefly explaining their question or topic (one minute should suffice for each). Everyone dot votes on the topics they most want to discuss. Each attendee gets three votes to spend – they can put multiple votes on any one topic and can vote for their own topics if they so wish. 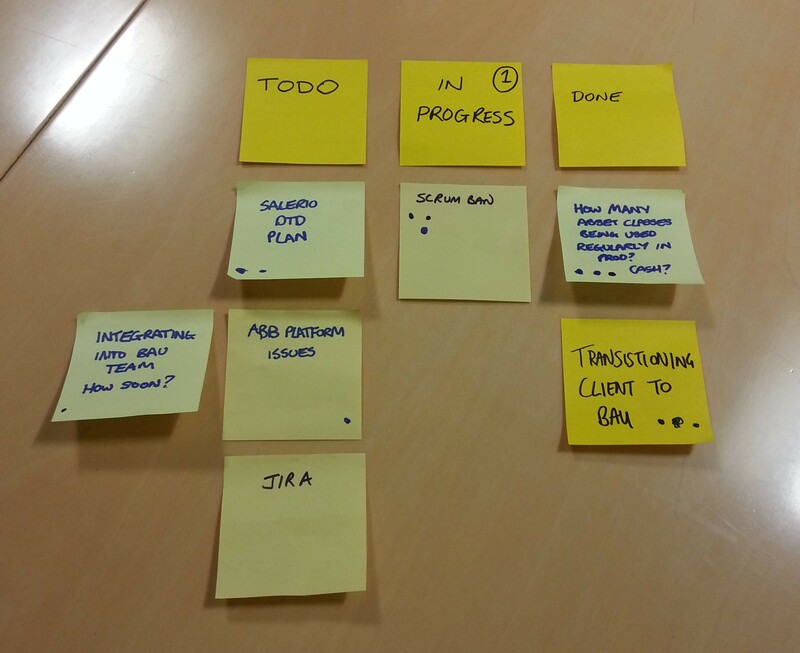 A Personal Kanban is created with three columns: To Do, In Progress, Done. The In Progress column is WIP limited to 1. Stickies are used to create the headings (see picture below). All topics are placed under the To Do column in priority order according to the number of votes they have received. The top topic is moved from To Do to In Progress. A 15 minute discussion ensues around the topic. A smart phone is handy to do the timing. If discussion around the topic dries up before the 15 minutes are up then progression to the next step comes early. Any corrective actions that are raised during the discussion should be noted down for agreement at the end of the session. The topic is moved to the Done column and the next To Do topic is moved to In Progress. Repeat from step 6 until the session time or topics are exhausted. What Don’t We Understand That Needs To Be Clarified for Future? 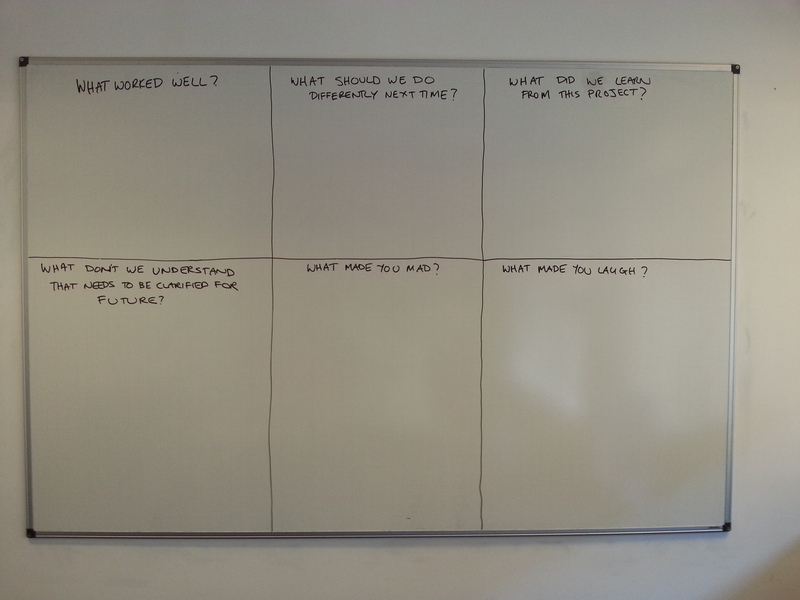 You can target specific topics by introducing specific questions to address them, for example, to explore an event, good or bad, that has occurred in the preceding sprint. Note that while this technique works well for sprint retrospectives I find it to be especially powerful for project retrospectives where a longer period of time is being considered. All of the pictures below were from a recent project retrospective I ran hence the sheer number of answers that were given. In preparation for the session I send out the questions to the team in advance to encourage as much feedback as possible. In the case of a project retrospective I do this several weeks in advance. I also encourage the team to bring any answers they have pre-written on stickies so that ideas they have before the session are not lost and to speed the session up a bit. Keeping retrospectives engaging, and therefore effective, requires constant work on the part of the Scrum Master. Having a static set of techniques, however tried and tested they may be, is not enough and we have to keep innovating. I find I have to constantly seek out new techniques to accomplish this. Fortunately Agile practitioners are a generous bunch and new techniques are constantly being published on their blogs. I have not been taken with every technique I have read about or gone on to try out and frequently make my own small adaptations to those I do use to increase their effectiveness for my team’s particular circumstances. This amounts to quite a lot of work but the rewards in the form of continuous improvement are worth it. Perhaps in another year’s time we’ll see the publication of Sprint Retrospective Techniques 3. This entry was posted on April 21, 2013 at 3:04 pm and is filed under Agile, Scrum. You can subscribe via RSS 2.0 feed to this post's comments. Very useful! I have tried techniques 2 and 3 and now I’m going for the first! Thanks for the valuable resources!